Thank you to all who entered, we will post another contest soon! A classic gift with timeless treats. Babka (from the Russian word for “grandmother”) is made by folding and twisting layers of amazing chocolate into delicious, rich dough. Rugelach means “little twist” in Yiddish, and we’ve twisted ours around aromatic cinnamon. 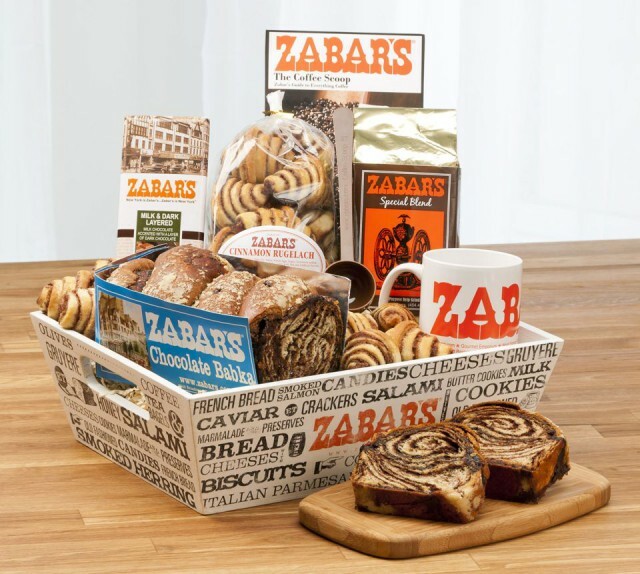 We load up our reusable “Zabar’s is NY” wooden crate with a Zabar’s chocolate babka, Zabar’s cinnamon rugelach, a Zabar’s chocolate bar, a pound of Zabar’s Special Blend vacuum packed coffee, a Zabar’s coffee mug, a Zabar’s coffee scoop, and instructions on brewing the perfect cup. Part of Zabar’s Gift Boxes, Gift Baskets, and Gift Crates Collection. How awesome is that?? Mmmmm, babka. It’s easy to enter! Step 1: Leave a comment here on this blog post (below) and let me know what your favorite holiday food is. Step 2: If you want to enter the contest twice, “Like” Zabar’s on Facebook and The Shiksa on Facebook— just let us know in your comment that you have liked both pages, and we’ll enter you in the contest again! With all of the special Facebook promotions and in-store offers Zabar’s has planned for the holidays, you won’t want to miss out! When you enter, your email address will be subscribed to the Zabars.com newsletter, which means you’ll receive their weekly emails with free recipes and special promotions. (If you’re already a subscriber, no problem– just let us know and we will verify!). A winner will be chosen at random and contacted via email. Contest starts today and ends on Friday at 5:00 PST. While you’re waiting to find out who the winner is, be sure to check out Zabars.com for their amazing selection of holiday gifts and treats. Please note that this prize can only be shipped within the US, and we cannot ship to P.O. boxes, A.P.O.s, or F.P.O.s. Prize may be shipped after the holidays depending on Zabar’s shipping schedule. Winner will be notified via email and announced on my website as well as Zabar’s blog. Good luck! Please do not comment on this post, as we are no longer accepting entries. Must have latkas we are trying sweet potato this year something new. I like my Mother’s homemade rolls they make the holidays for me!! My favorite holiday treat is my Grandmother’s Mandela broit! She is 103 years old and we still make them together! We love latkes and brisket! Oh, there are so many awesome holiday foods! How to choose! I’ve only got two minutes so…my favorite holiday food would have to be Latkes that my brother-in-law z’l used to make. My favorite holiday food is Chicken Soup, and my mom’s strudel! I am really enjoying your recipes! For Passover my favorite recipe is my Mom’s fried matzoh Balls…for Chanukah a recipe from an Israeli friend for Sufganiyot (jelly donuts). I “liked” both you and Zabar’s on FB! At this time of year, I love latkes! Answering which holiday food is my favorite would not be an easy one. When it comes to Chanukah i really enjoy warm jelly doughnuts but LOVE crispy potato latkes. Actually, since i barely cook any longer, i tend to love and appreciate anything that my son and daughter in law share with me. Thank you for your consideration. Hands down noodle kugel! I’ve been a subscriber to your page and just clicked “like” on Zabars FB page! My favorite holiday food is honestly Marzipan candy. Roasted Parsnips, Carrots, Potatoes with real butter would be the next best thing to eat. Oops. Liked you both on FB! Mom’s Bing Cherry salad! With cream cheese, nuts, cherries, jello. Can’t go wrong with that. Oh, boy – that’s a tough one. I could truly pick one for every holiday! But since it is December and Chanukah is coming soon, I’ll go with Latkes – crunchy hot potatoes – what could be bad? (FYI – I like you both on FB) Cheers! I liked your page and Zabar’s, too. Used to shop there all the time growing up in NYC. my favorite holiday food is potato latkes with apple sauce. Yummy………. I like anything with custard on it during the holidays. I love matza brei on Passover. In fact, I love all my Passover recipes…it’s a chance to be creative in the kitchen! I love latkes too…will definately try this recipe. I also liked Zabar’s and The Shiksa on FB!!! Mhmmm…this is a hard Q to answer for a foodie. I would have to say something on the savory side of holidays – turkey, mashed potatoes…can’t get enough! My family celebrates Hanukkah and Christmas, so to represent both holidays and traditions my favorite Hanukkah food, of course, are potato latkes topped with homemade apple butter. My favorite Christmas food is homemade gingerbread! “Liked” both sites and voted for you, too. Favorite “holiday” food is Fried Matzoh (only once a year). Love your blog and recipes! Favorite Holiday foods? (which holidays??). I think nearly all of them. Rugelach and Potato Latkes are good… Matzo brie is good. Babka is good. Matzo ball soup is good. Pumpkin pie is good. It’s all good – especially when shared with family!! I liked both Zabar’s and your blog on FB. Your Pumpkin Spice Cake!!! Awesome! I have “Liked” both yours and Zabar’s FB pages. I love, love, love potato latkes. I simply “doctor-up” store bought boxes, follow the directions on the box and add a little onion salt and defrosted frozen shredded potatoes. Fry in some canola oil and drain on clean brown grocery store bags. Viola! Just like “from scratch” without having to grate the potatoes! I’m making 200 of them for this year! I set up a “Latke Bar.” Using my old Salton hot tray to keep the latkes warm, I set out about 6 assorted toppings; applesauce, cinnamon applesauce, salsa, sour cream, caviar, even guacamole! And added this year will be some hot sliced corned beef and Russian dressing, as someone said latkes instead of rye bread make the very best sandwiches! My favorite holiday food Crostoli cookies. A tradional italian cookie. Fried and then you add lots of honey and walnuts. A perfect cookie for Hanukkah as well!! Potato latkes with sour cream. Potato latkes are my favorite holiday food. No contest. I adore potato pancakes with organic applesauce from Trader Joe’s and a dollop of sour cream! Noodle Kugel is my favorite for EVERY Holiday! I even made one for Passover with kosher for passover noodles. YUMMY!! My favorite holiday food has to be dessert. it is what I look forward to. My Bubbe and my Mom were the best cooks, I just wish they wrote down their recipes. I come close but not exactly like theirs. I do have a lemon something recipe my Bubbe wrote in Yiddish, because she didn’t know English, but I don’t know Yiddish. And now that I said that I will have to search the house for it, which could take a while because I have a Brain Tumor, so my memory is even worse than it was when I just had a bad memory, lol! Favorite holiday dish is Noodle Kugel. It makes every holiday more delish! Oh, in addition to liking latkes, I also “liked” Zabars and The Shiksa on Facebook! hands down linzer tart cookies…. Rosette’s drizzled in chocolate or filled with cheesecake and fruit. Yum!!! I liked Zabar’s and Shiska’s on facebook. Give me chocolate babka anytime!! Hard to find her in Sacramento. I have one in the freezer just waiting for Hanukkah!